Transitional style is the buzzword in today’s home design and decor. It’s a fusion of traditional and contemporary design but in Florida, we’ve got our own take on this trend: It’s called Mod-Mediterranean. Orlando Custom Home Builder Jorge Ulibarri says a lot of clients are asking for the Mod-Mediterranean look in new homes because it’s timeless yet reflects some of today’s trends. The key to successfully creating this New twist on Old World design is striking a balance between the sleek, shiny, edgy, urban and the rustic, timeworn, traditional. Jorge says to create the look, first define style of the large surfaces and elements in the home such as floors, ceilings and solid surfaces. “Do you want them to be rustic or modern? Once you’ve established the style of the base decor of your home, go in the opposite direction with details and accents,” explains Jorge. For example, if your floors are rustic, perhaps made of chiseled-edge travertine, add in modern details such as stainless steel, metallics, quartz and glass to bring in a contemporary edge. Let the defined style of your base decor and accents be your guide as you pull together the Mod-Mediterranean look in architecture and decor. Here are few ideas from a Mod-Mediterranean home Jorge has under construction with 4,900 square feet of living space that dances between both worlds: Modern and Old. This barrel ceiling features travertine square tiles as the primary material with glass tiles in brown and beige forming the decorative edge for a seamless blend of rustic and contemporary materials. 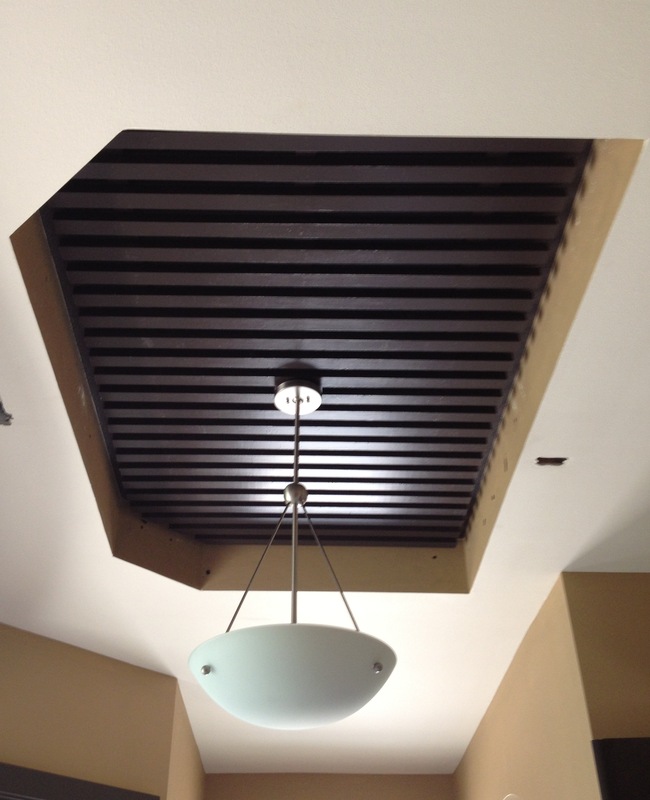 A Mod-Mediterranean style barrel ceiling. 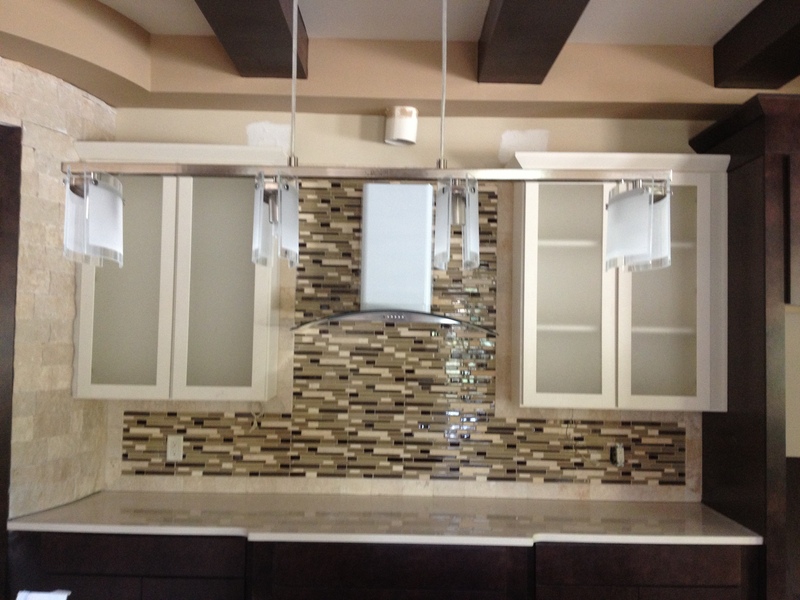 Notice how glass tiles in earth tones edge the rustic travertine tiles for a seamless blend of Old World and Modern. 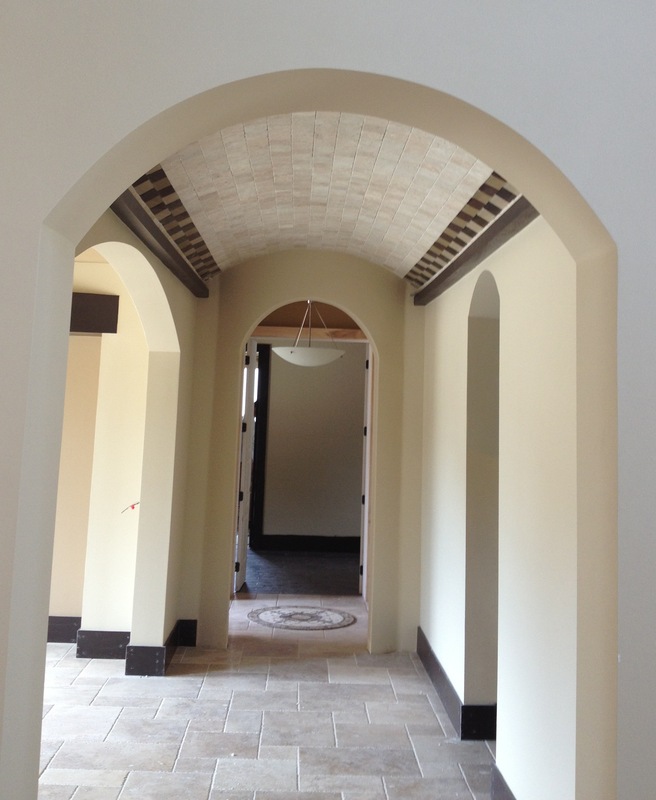 This hallway is in a Mod-Mediterranean home under construction by Orlando Custom Home Builder Jorge Ulibarri. This ceiling uses rustic materials in a contemporary design. Notice how the painted wood planks form a decorative grid recessed in the ceiling and anchored by a contemporary light fixture. In this home, the canvas or large surface areas are rustic and the accents are contemporary. This kitchen blends both styles by balancing out traditional materials with sleek accents. Notice the wood beams in the ceiling and the rustic stone on the curved pantry wall that frames a sleek flat-paneled wood door. The glass mosaic backsplash, metal-framed, frosted-glass panel cabinets, stainless steel sculptural range hood and industrial light fixture give the kitchen a modern edge. White quartz on the kitchen countertops keep the aesthetic clean and sleek. A split height kitchen island breaks with traditional style. 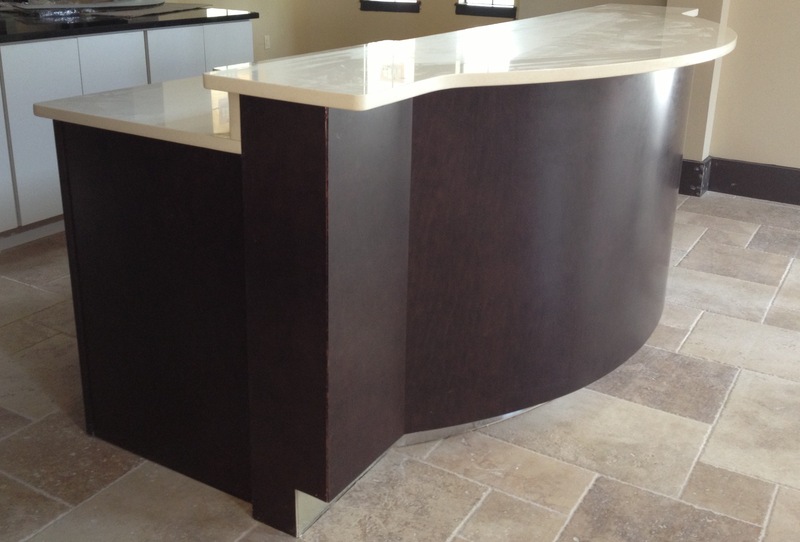 Notice how the white quartz countertops have a clean, simple edge, nothing embellished. The kitchen’s white, flat-paneled base cabinets contrast with the island’s darker wood base melding modern-style cabinetry with rustic chiseled-edge travertine flooring. Creating focal points that blend traditional and contemporary materials will pull together the Mod-Mediterranean style. 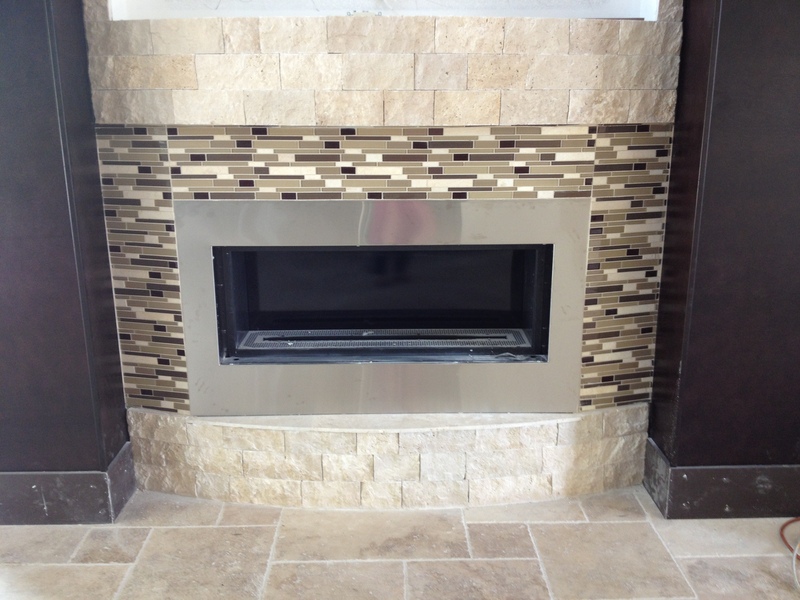 This 24-foot fireplace mixes contemporary glass tiles with wood panels and rustic stone. The stainless steel hearth injects modern metallic into the design for a fireplace that is timeless yet current. 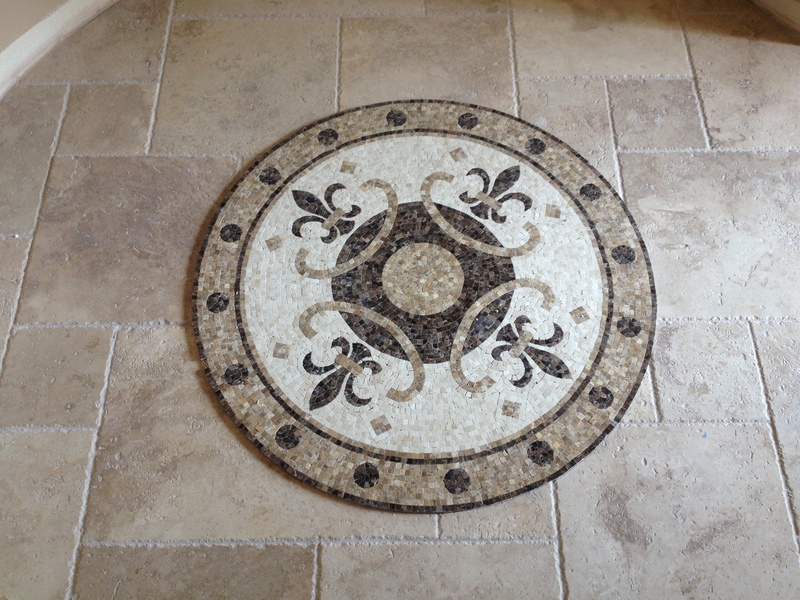 The home’s rustic canvas relies on chiseled-edge travertine stone as the base but shiny glass mosaic floor medallions throughout the living space create visual surprises and opportunities to inject more modern design accents. This seamless blend of Old World and modern continues outside as well. 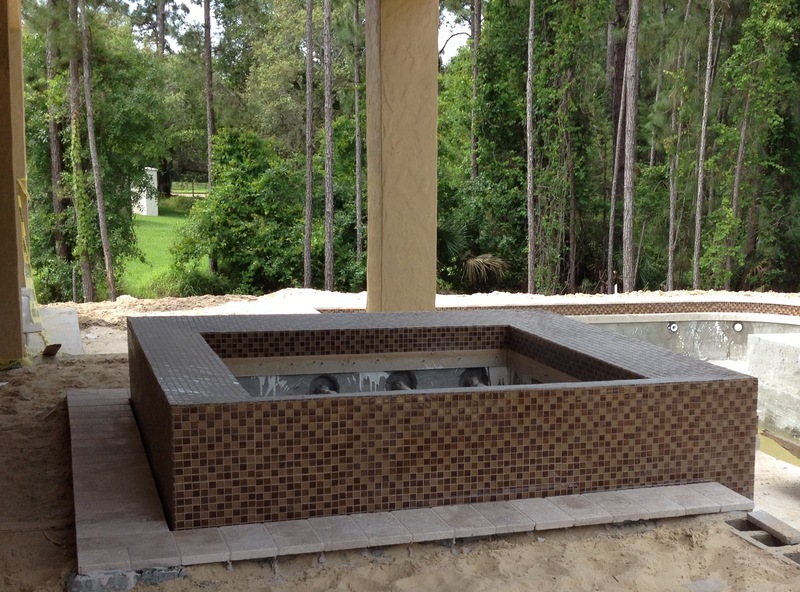 The home’s outdoor living space features a glass tile spa and pool with travertine pavers. For more Mod-Mediterranean design ideas, check out this episode of Trade Secrets by Jorge and keeping checking back for more photos of the home’s finished spaces.